What to Do With My Upside-Down House? "For many years, my wife, Kathleen, and I have been pretty much ignoring the fact that we have an upside-down house, and we don't know what to do with it. For that reason—and because we don't want to ruin our credit rating—we've been hanging on to our upside-down house. However, my wife just lost her job, so we have to make a decision now and deal with this. What options are available to us? What should we do with our upside-down house?" When housing prices first began to decline in 2005, many homeowners rushed to dump an upside-down house. But many more held on. These homeowners, like you, watched their home prices collapse and some, I bet, have felt like the last captain standing on a sinking ship. The good news is there are many options available to you. 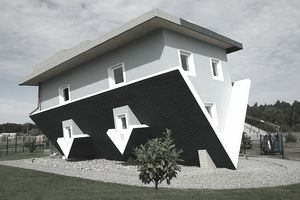 The very best solution for that upside-down house is to turn it right side up again. The way to do that is through a principal reduction program. The problem with a principal reduction program is your bank would have to forget about that portion of the debt that is underwater, and not every bank will do this. In fact, very few banks will forgive debt in that manner. But you should ask your bank to do it. You might ask why won't more banks participate in a principal reduction? Your bank is probably willing to do a short sale, which involves forgiving the debt. Why won't the bank forgive the debt for YOU, a borrower who has made payments on time each and every month and is in good standing with the bank? Why are you penalized? And those would be excellent questions to ask your bank. They are also excellent questions to pose to Congress. Some sellers do not care that they will owe more than their homes are worth for years and years. To these sellers, the mortgage balance is meaningless in comparison to the devotion they feel toward the home. They do not want to move under any circumstances. They are very happy if the lender will just lower their monthly payment through a loan modification. These types of sellers are typically employed, and they can afford their payments, but their mortgage payments often make up more than 1/3 of their gross monthly income. If they can pay less than that, they are satisfied. The previous HARP program was pretty much a failure, so the government has modified its HARP refinance program. It is offered only for existing Fannie Mae and Freddie Mac loans. Most of the borrowers who apply for this program do so because they want to keep their home and they want a lower monthly payment, in addition to a lower interest rate. The main drawback is this program does not reduce the principal balance. It's similar to putting a gun to a borrower's head and not pulling the trigger for a while. I suspect every person who works with distressed homeowners has touched the fire. Homeowners are angry. They start out in pain, but that can quickly develop into hostility after they try to work within any given bank's convoluted system. It's these frustrated and angry homeowners who tend to stop making mortgage payments and thumb their noses—baring for the camera whatever they feel brave enough to bare—and finally send the home to foreclosure. They think they are "sticking it to the man," but often they end up hurting themselves. There are better choices than foreclosure for a home owner. Nobody can give a house back to the bank because the bank didn't own the house in the first place. It is a misnomer. The bank does not take back a house. A bank might seize a home in foreclosure, but it doesn't take it back. Banks will sometimes offer to let the owner deed the property to the bank. It is called a deed-in-lieu of foreclosure. It is often in the bank's interest and rarely in the owner's interest. If your goal is to stick it to the man, do not sign a deed in lieu. From a purely financial point of view, a short sale is your second best option, right next to a principal reduction. Because it gets rid of the mortgage debt. In some short sales such as a California short sale, the process will free a seller from the obligation and liability. There are many different types of short sales. To find out which is best for you, talk to an experienced short sale agent. Not every short sale is the same, and a slight twist made by an experienced agent can mean the difference between getting cash for a short sale vs. having your short sale rejected.